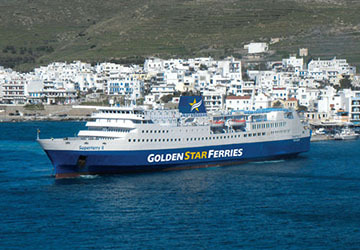 Superferry II can carry up to 1,630 passengers and contains a garage deck that caters for anything up to 250 vehicles at a time. The vessel can reach speeds of up to 21 knots when sailing between destinations. This stabilised ship is fully air conditioned throughout. You’ll be able to make your crossing in great comfort. 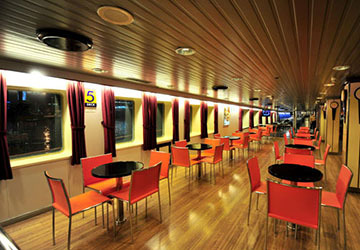 Cabin accommodation is available and padded airline style seating is placed throughout the public deck areas. 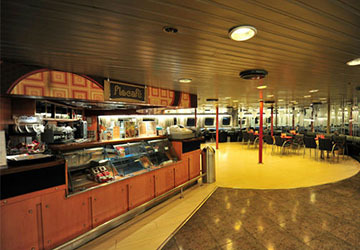 Many food and drink options are located on the ship, both inside and out on deck. Other amenities include satellite television, a home cinema room and shopping facilities. 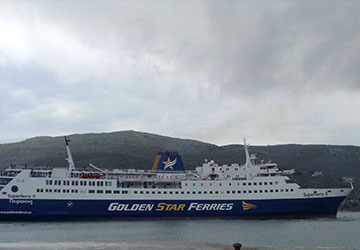 The ferry has been adapted to cater for travellers with restricted mobility. Airline style seating will provide you with the perfect place to sit back and enjoy your smooth sailing. 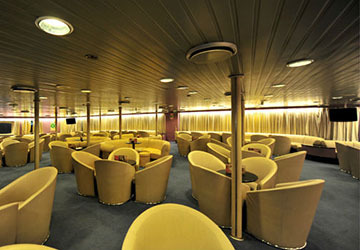 There are enough seats for every passenger with the padded seats situated throughout the public deck areas. For those seeking a little extra privacy and luxury, cabin accommodation is available with comfy beds with fresh linen and towels provided. A number of rooms are specifically set up to cater for those travelling with pets. 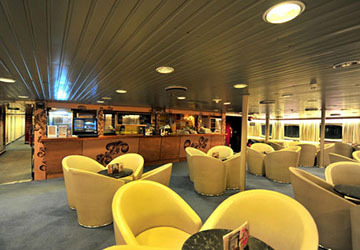 There are food and drink outlets both in and outside the ship. Inside, the Golden Café coffee shop serves meals and snacks as well as barista style coffee, soft drinks and a range of alcoholic beverages. Out on deck, with views of the crystalline waters, you’ll find the Open Deck Bar. Here you can take a sip of something in the sun or quell your hunger whilst topping up your tan. If you are in need of some holiday essentials, souvenirs for family and friends or even just a treat for yourself, then you can purchase these in the ship’s shop. You’ll also find the usual magazines, confectionery and other small items available to buy. There are entertainment options for passengers to take advantage of whilst making their journey. Satellite televisions are located throughout the large number of seating areas as well as a designated home cinema room where you can watch some of the latest releases. Wi-Fi access is available throughout the ship. Smoking is permitted in certain sections of the vessel but there are non-smoking sections so everyone can relax in the section that suits best. 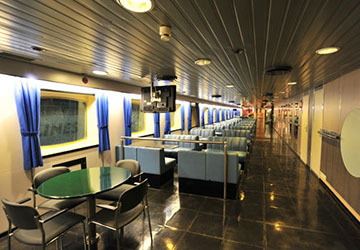 The Superfast II also has an on board infirmary bay. 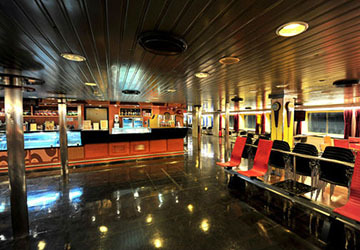 The ferry is adapted to cater for those on board with restricted mobility. 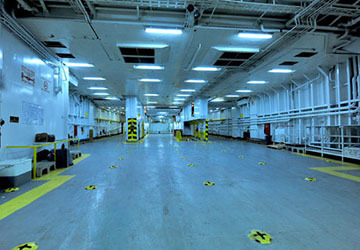 There are elevators and escalators to help move between decks, as well as specific cabin accommodation for passengers with special requirements. 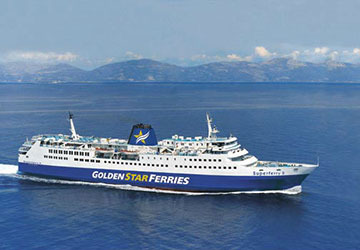 Please Note: Whilst we have taken great care in making our Superferry II guide as accurate as possible, onboard facilities, services and entertainment may vary depending on the date and time of year that you travel, facilities mentioned may change without notification and ferry companies reserve the right to operate vessels other than those mentioned at time of booking without prior notification.